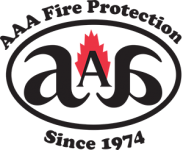 For the finest fire protection and fire suppression products and services, including commercial fire extinguishers and fire extinguisher cabinets, AAA Fire Protection Services is Richmond’s first choice. We carry the best brands of equipment and have the most professional service providers in the industry. Our technicians perform grease exhaust and vent cleaning and filter exchange; we design, install and service sprinkler systems, install kitchen fire suppression systems, restaurant and industrial fire systems. We know that fire protection equipment in and of itself, is never enough. What really sets AAA Fire Protection Services apart is customer service. Our techs care and they are devoted to keeping your Richmond restaurant, factory or commercial property safe! AAA Fire Protection Services prides itself on having the familiarity and equipment to keep your Richmond commercial kitchen, restaurant or industrial property safe, and the experience to know what is effective against fire and what isn’t. We would never sell you a product you don’t need. We are affordable, and have honestly and ethically served Richmond since 1974. Over the years, our staff has seen every change in the equipment. We keep current with the best ways to guard you and your facility.